With a final total of 404-303 over Supernatural. Going into the tournament, Fringe managed the #7 seed in their bracket, as did their challenger in the final Supernatural. Those rankings were however.... a little decieving, as all the TV networks (24 in total) were given the top seeds. So even though they were the #7 seeds, they were really, 1 of the top 6 shows votes wise in the nomination process. 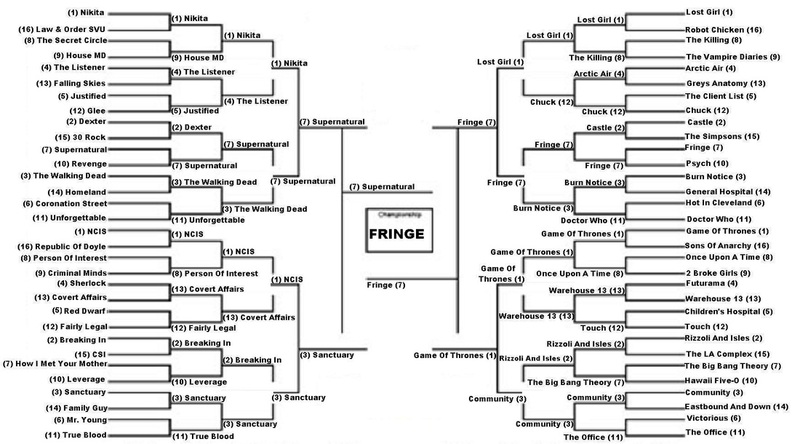 Before toppling Supernatural in the final, Fringe beat Psych 175-106, beat Castle 357-228, beat Burn Notice 506-487, beat Lost Girl 328-326 and beat Game Of Thrones 208-190 on their path to the championship. Supernatural came in also a 7 seed, but 5th in nomination votes. Before losing in the final, Supernatural beat Revenge 44-26, beat Dexter 146-52, beat The Walking Dead 412-343, beat Nikita 232-189 and beat Sanctuary 222-194 on their path to the finals. A full blog report on the tournament will come in the next couple days & the link will be posted here. DR. LAUREN LEWIS "LOST GIRL"
With a final total of 290-235 over Olivia Dunham of "Fringe". 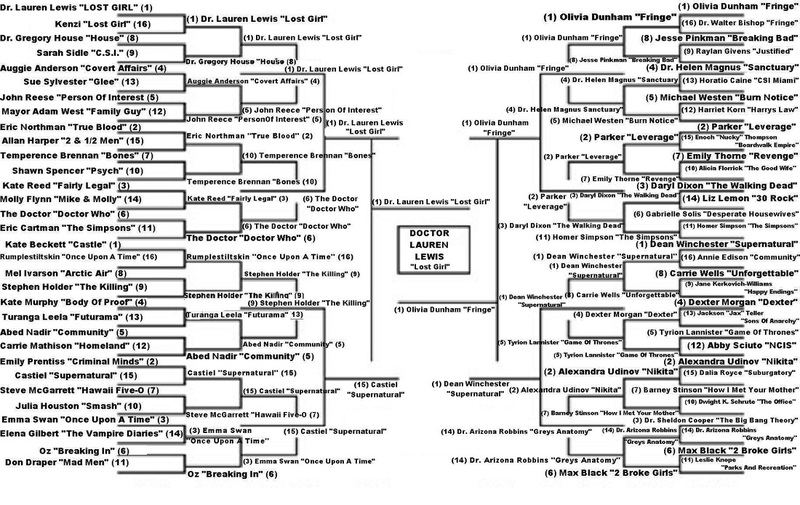 Going into the tournament Dr. Lewis (played by Zoie Palmer) & Agent Dunham (played by Anna Torv) were both the #1 seeds in their respective brackets, and the #1 & 2 vote getters in the nomination process. Before toppling Olivia in the final, Dr. Lauren Lewis beat Kenzi "Lost Girl" 1100-92, beat Dr. Gregory House "House" 1512-306, beat John Reece "Person Of Interest" 558-241, beat The Doctor "Doctor Who 328-217, beat Castiel "Supernatural" 346-212 on their path to the championship. Before losing in the final Olivia Dunham beat Dr. Walter Bishop "Fringe" 902-165, beat Jesse Pinkman "Breaking Bad" 418-213, beat Dr. Helen Magnus "Sanctuary" 402-156, beat Parker "Leverage" 392-248, beat Dean Winchester "Supernatural" 245-226 on their path to the finals. A full blog report on the tournament will come in the next couple of days & the link will be posted here. Here is the brackets for the TV Show portion of the tourney. Click on image for larger view. 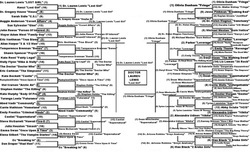 Here is the brackets for the TV Character portion of the tourney. Click on image for larger view. THE FINALS - TV Shows & Character Matches ended June 3rd! THE FINALS ARE CLOSED! WINNERS HAVE BEEN POSTED! These TV shows earned spots in the round of 64 for May Madness on the basis of highest vote totals in a group, or being the highest voted show from a TV station. These characters were guaranteed spots in the round of 64 for May madness on the basis of winning groups or tiebreakers they were in.